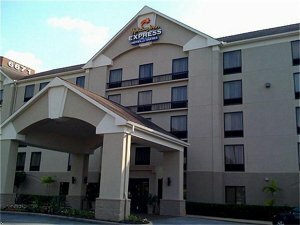 Welcome to the Holiday Inn Express Hotel & Suites 59 S. Hillcroft. Just minutes from the world famous Galleria Shopping Mall and a diverse variety of elegant cuisines, travelers appreciate how our corporate atmosphere makes comfort and convenience a top priority. 11 Miles from downtown Houston, 18 Miles from William P. Hobby Airport (HOU), and 30 Miles from George W. Bush Intercontinental Airport (IAH). We are located at the Hillcroft exit on Hwy 59 South in between Beltway 8 West and 610 West.This near Galleria hotel will help you maintain your exercise regimen in our fitness center. Relax and cool off in our outdoor pool and catch up on work in our business center.Start your morning with our free Smart Start breakfast buffet. which includes eggs, bacon, omelets, and biscuits with gravy.Our corporate meeting room is ®The Place To Meet®. We offer meeting events for all your business needs.Businesses near hotel:Fugro, and Wellsfargo Bank.The Holiday Inn Express Hillcroft - everything you expect, and much more. This hotel is committed to providing accessible facilities under the American Disabilities Act. If your accessibility needs are not met, please contact the Hotel Manager on Duty. Should you require additional information regarding accessible facilities for guests with disabilities, please call 1-800-Holiday (U.S. and Canada) or contact the hotel directly. For the hearing impaired, TDD service is available at 1-800-238-5544 within the U.S. and Canada.